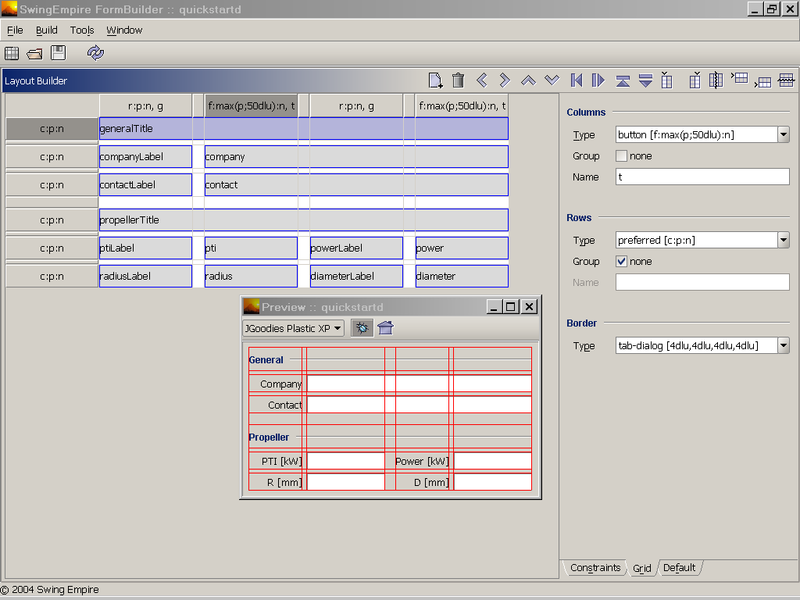 SwingEmpire FormBuilder is a framework to help building form-based GUIs with JGoodies Forms. 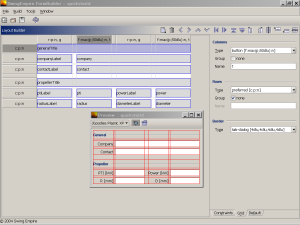 The basic driving theme is to keep different roles of developing a GUI on top of an arbitrary business model as decoupled from each other as possible - which will make it flexible, easily (re-)usable and powerful. The package has two major parts: a visual builder to create the layout and presentation details of a form and a loader framework to use this layout. Note: The builder is deliberately not a WYSIWYG builder: the layout should be described independently of any concrete widget toolkit. Instead, the result of the building process is used to drive a preview of a container hooked to a given toolkit (here a UIFactory producing Swing widgets is used).